A. Mouse IgG2a negative control (MCA929) followed by Goat anti Mouse IgG2a:PE (STAR133PE). B. Mouse anti Bovine CD8a antibody, clone 7C2B (MCA6083) followed by Goat anti Mouse IgG2a:PE secondary antibody (STAR133PE). 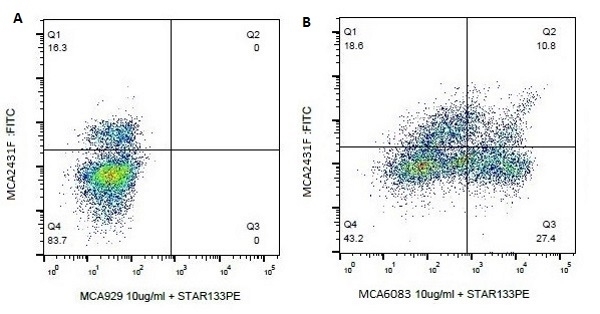 Both the Mouse IgG2a negative control and Mouse anti Bovine CD8a are plotted against bovine CD40 as recognized by FITC conjugated Mouse anti Bovine CD40 antibody, clone IL-A156 (MCA2431F). Mouse anti Bovine CD8a, clone 7C2B, recognizes bovine CD8a. CD8a is a coreceptor for MHC I molecules. It is involved in the activation of the cytotoxic T-cell response and the clearance of virally infected cells. CD8 is predominantly present either as homodimer or a multimer of the alpha chain or as heterodimer of the alpha and beta chains (Littman et al. 1987). Bovine CD8 differs from the CD8 molecules of other animal species and shares 57.85% identity with swine, 37.70% with mouse, 27.50 % with chicken, and 20.69% identity with carp (Zhenbao et al. 2014). Mouse anti Bovine CD8a, clone 7C2B recognizes bovine CD8 lymphocytes and gamma delta CD8+ lymphocytes (Park et al. 2000). In addition it reacts with the CD8 lymphocytes of water buffalo (Davis et al. 2001). Koo H.C. et al. (2004) Analysis of the immune response to Mycobacterium avium subsp. paratuberculosis in experimentally infected calves. Infect Immun. 72 (12): 6870-83. Allen A.J. et al. (2009) Development of a bovine ileal cannulation model to study the immune response and mechanisms of pathogenesis of paratuberculosis. Clin Vaccine Immunol. 16 (4): 453-63.